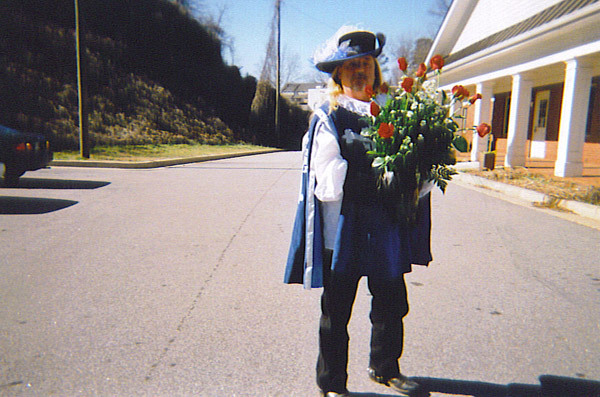 I was born and raised in Raleigh N.C. At the age of 13 my family moved to Md. We lived there only 1 year and then moved to Fl. I got to see and hear the Apollo space shots. We all became beach lovers and spent as much time on the beach as possible. I attended schools for the blind through the 7th grade. Then I attended a public school. I got in some trouble, nothing bad, just in the wrong place at the wrong time and did not finish high school. The full story is something that one might find in a good romance novel. I took the GED and started college sooner that if I had finished high school. I did get a degree from Florida state. Have you been without sight your whole life? Yes I have been blind all my life. I had an accident that should have killed me, and believe that it did for a while when I was 1 1/2 years old. A 1940s, 4 door car, a tank, ran over my head, across the eyes. The accident damaged the optic nerve. At this time there is not any drugs or surgery that would improve my sight. There may be in the near future. I know that being blind has kept me alive for this long. It holds me back just enough that I do not do things that might kill me. I have done just about anything that I wanted to. I tell people that I am CRAZY to keep from being insane. I imagine you appreciate the smell of horses more than the average horse lover, is it true that the lack of one sense makes the others more enhanced? I say that my other senses have become more practiced. The other senses are used more. Remember practice makes better. I have been around horses so long that I can tell if a mare, gelding or stud has urinated. 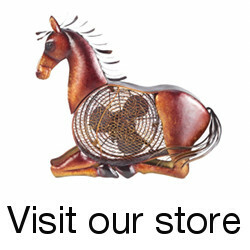 Have you always been a horse lover? Yes I have always loved horses. One of the great things about attending schools for the blind was that I was sent to summer horse camps. I was taught how to care and ride horses. At one of the schools I was given the responsibility of taking care of a pony that was kept on the campus. I also rode this pony anytime I wanted. I would get up early just to ride. What kind of horses do you ride? 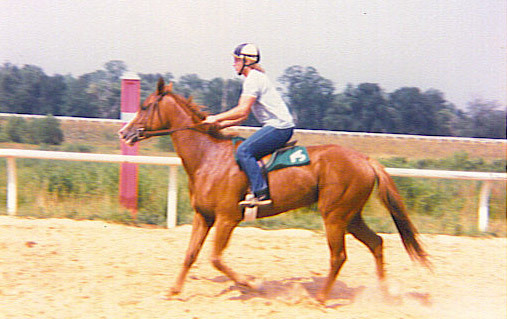 I have 2 Thoroughbreds off the race track that were given to me and I ride them. Unfortunely the tattoo can not be made out by anyone that has looked at them. I would love to have a tattoo research done. These two Thoroughbreds are also used in an equine therapy program that I am involved in. I also help care for and train Arabians. I like to try and ride 3-4 times a week. One time one Thoroughbred, then the other one. You have a seeing eye horse named Zesta, can you tell us a little about this animal? I had a seeing eye horse named Zesta. She has long sense passed. She was a Plantation Tennessee Walker. Her Full name was Zesta Fair Lady. The name fitted her because she was full of zest, she was fair, and she was a lady. I still think about her today. She was the first horse I owned. She also was the most and best trained horse that I had ridden at the time I bought her. Sorry to hear you lost her. Did you find that Zesta knew she had to keep an extra eye out for you? Yes, she learned very quickly that I was blind and she better take care of me. By taking care of me, she also was taking care of herself. I learned to trust her completely because when I did not, I got hurt a few times. There were a few times if I had not trusted her, she and I might have gotten killed. You train horses also, that must be both challenging and rewarding for you. Do you have secret methods you use? The only thing that may be my secret is that I do depend on my other senses more. I can sense when a horse feels off or is moving wrong. In fact trainers and bets have asked me my thoughts about might be going on with a horse. Horses seem to communicate through touch. I have very sensitive fingers because I read Braille. I also feel that I have a physical, mental, and spiritual connections with horses. I remember one time when a new horse was delivered to the farm were I was keeping Zesta. The person unloading the mare told me that she did not like men. Well guess what happened when the mare got off the trailer, she walked up to me first, even before the new owner, who was a female. Can you explain horse dancing to us? 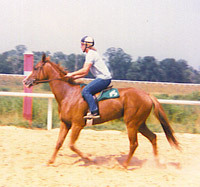 There are four dances that I do with horses in every day handling, training, and riding. These dances are how horses and I interact. There is the Waltz, Twist, Tango, and Free Style. The Waltz being the most desirable. Recently you’ve been taking moonlight rides, that must be an invigorating experience, tell us about it. I started doing FULL MOONLIGHT rides in the early 80s with Zesta. I have taken so many that I can not remember how many and what happened on them all. I stopped riding by the FULL MOONLIGHT a few years ago, why I am not sure, but have started back and intend to make as many rides as I can. There is nothing like it. In 2000 a few of my friends and family took a FULL MOONLIGHT ride under a moon that was in a point in the sky that it had not been in for a 135 years. Another time a group of us camped up on a mountain, ate like kings and queens. Then we rode under a clear sky, FULL MOONLIGHT and out of nowhere we saw a strike of lightening. I was the one that got every one in the group to start riding under the full moon. Any one that rides should do it at least once. Riding under FULL MOONLIGHT is something in enjoy the most doing by myself. It makes my body, mind, and spirit soar. I like bull riding, rodeo, anything to do with horses, water skiing, and skydiving. I love swords and have a number of them many different sizes and shapes. Just to list a few. Last question – If you only had one sentence to convince someone who is afraid of horses to get on one, what would you say? That is hard to put in one sentence. In the therapy program that I am involved I have been able to get those that were so scared to get on that they were crying. By the end of an hour they were ready to go from riding the small Arabians, to riding one of the Thoroughbreds 15.2 hands and wide. worried about you because you will not have fun and might get hurt. You can hear more details to each of these questions by going to the website listed above were I do radio blogs, so you will hear some of my life in my voice. THANK YOU for listening. This entry was posted in Interviews on June 9, 2009 by The Equinest. Great interview! Love this story. It’s an inspiration.